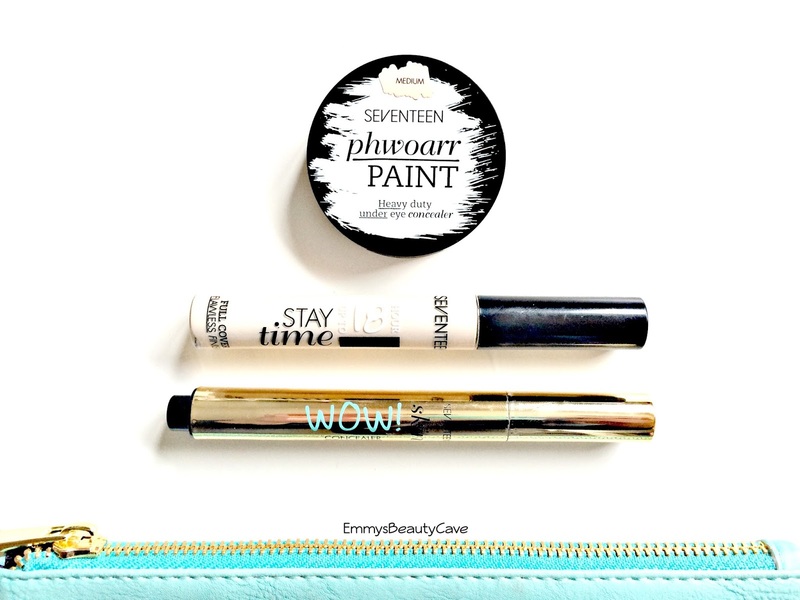 Seventeen is one of my favourite high street brands, I especially love the base products. The Seventeen Stay Time Foundation is one of my holy grails, especially if you love full coverage. 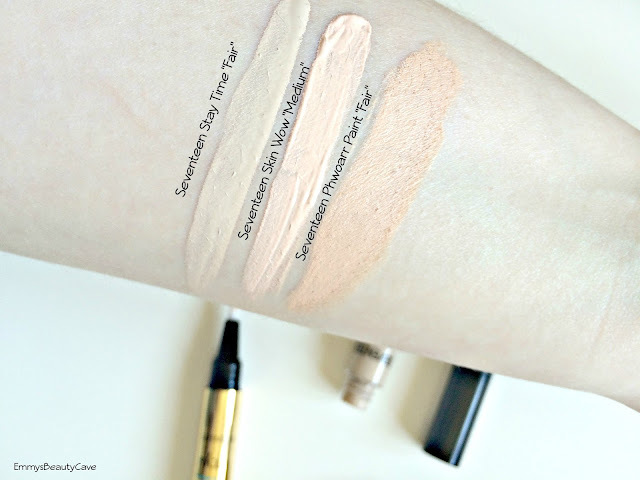 I thought I would do a comparison post on the Seventeen Concealers so you can figure out which one is for you. If you read my blog you will know I own far too many foundations and my concealer stash isn't far behind! This is described as a heavy duty concealer for under eyes. This is the first Seventeen concealer I owned and I am very impressed. It comes in a small compact as it is a cream concealer. I have the shade fair which in the pan and the swatch looks quite dark but it isn't. It is more of a peach tone so it will help colour correct those dark under eye circles. If you have really dark under eyes this will be perfect for you. I swirl my ring finger in the pan and then gently tap it under my eyes blending it out as I go. This is definitely for people who prefer fuller coverage rather than a light natural makeup look. I LOVE this concealer. Again it is described as full coverage but with a liquid consistency. I have previously compared this as a dupe for the Urban Decay Naked Concealer. It is very creamy and the shades are perfect for us paler girls. Seventeen do need to create more shades for darker skin tones. I love using my Becca Under Eye Brightening Corrector and then this concealer on top, it creates such a flawless look and stays put all day. One thing I love about this concealer is it is neither pink or yellow toned and more neutral which is perfect. This is the newest release from Seventeen and I originally wanted it in the shade fair but it is constantly sold out in store and online. I decided to pick up the shade medium which is still perfect on my pale skin. It is pink toned whereas fair is more yellow toned. It comes with a brush applicator like the YSL Touche Eclat Radiant Touch Concealer, the makeup artist on This Morning actually used the Seventeen one and said how she preferred it over the YSL one! It is perfect for highlighting and brightening. I find it is too light a coverage for my under eyes but as a highlight it works really well. I honestly love all three of these and will continue you to re purchase them. I love how Seventeen have created concealers for everyone apart from the skin tone issue. I really hope Seventeen start creating darker shades.